Hello my name is Maria Camila I live in Colombia and I am in 6 grade! One of the things I like the most is to play tennis, horseback riding ,shopping ,being with my friends also one of the things I love is to dance I love dancing!..My favorite things to eat are the pasta, Italian food in general also I love sushi and escargots! I hate eating chickpeas I don’t like them at all! Also I hate to see bull fight I don’t like animal abuse like to hear music is one of the things I like he most it relax me! If you want to continue knowing more about me continue seeing my blog and letting posts to get in touch! And WELCOME TO MY WORLD!.. This is shakira she is from Barranquilla Colombia I put it here in my blog because I consider her like model in dance I love how she dance and how she moves her body with the rhythm of the music! And doodle she dances amazing she sings fabulous!! This is Rodrigo Pessoa I put him in here in my blog because I consider him a very good rider! His horseback riding hobby is amazing he loves horses and he has been champion in the world equestrian games in the 2004! And the last world equestrian games at kentuky he stay in the fourth place…! 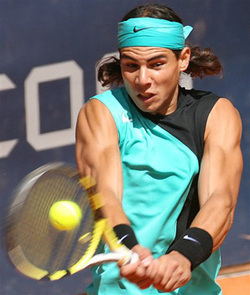 This is Rafael Nadal one of the best tennis players in the world, I put him here in my blog because one of my favorite sports is tennis and I enjoy playing it but one of the things that I enjoy a lot is seen Rafael playing his games and tournaments. Also he has won a plenty of important tournaments such us US OPENS etc!